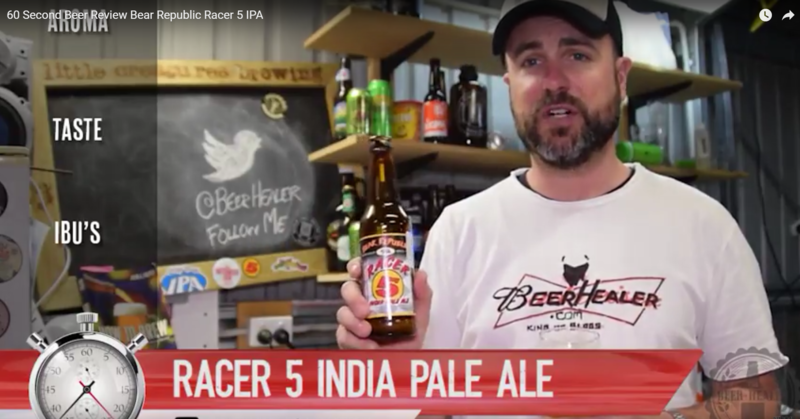 Back again with another 60 Second Beer Review, this time I have managed to get hold of a Bear Republic brew…Racer 5 IPA. I remember first hearing about this brewery in a season 2 episode of Brew Dogs. They seemed like a pretty cool brewery, and after reading a bit more about them, I have found out that they ARE indeed a cool brewery! I am really keen to get hold of more of their brews…maybe on my next trip to the USA. How many bottles can I stash in my suitcase to make it home with me? Is there a problem that I want to bring a styrofoam lined suitcase purely for the desire to bring home fresh beer? Maybe one day? I joke, but I did write about my desire to take a beer holiday in a previous post, California Dreamin’, my plans to visit a bunch of breweries on a road trip through California…Bear republic made the list, of course! Actually, if I was to re-write my Top 10 Craft Beers From the USA again, this one may just make the list. Anyway, I know this brew may not be new to all of you reading this, but it is to me and I felt it worthy of a review! Check it out below.